Equine nose bleeds are actually very common events. Epistaxis is the medical term for nose bleeds. Equine nose bleeds can be an indication of serious disease. Most often, however, equine bleeding is simply the result of extreme air movement in the delicate lung capillaries (usually near the end of a race) when equine lung pressure can reach 150mmHG (compared to 40mmHG in racing grey hounds or humans). This is often the result of airway obstructions due to dried mucous or infection (such as from a cold). It should be noted that 90% of equine bleeding occurs in the lungs with the other 10% the result of a blood vessel bursting inside the breathing apparatus in the head. Often with nosebleeds, the blood flows down into the windpipes causing the affected horse to be less ableto gallop effectively. Since what causes equine nose bleeds is not understood, effective treatment is difficult. 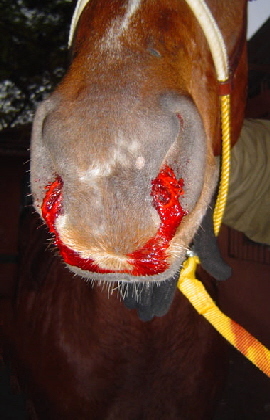 Interestingly, 98% of equine bleeding is never seen because the bleeding is not sufficient to reach the nostrils. But, for those 2% of cases where blood does reach the nostrils, equine nose bleeds are often dramatic and distressing to the horse owner. Each case needs to be assessed on individually as to its seriousness. For instance, it needs to be established how much blood has been lost, and if the blood is coming from just one or both nostrils. Bleeding from both nostrils typically means the blood is coming from the lungs and is commonly called EIPH (Exercise-induced pulmonary hemorrhage). Is there a solution for equine bleeding? Many equine experts believe so. They believe that the answer for equine bleeding is to deal with the root cause — which is insufficient power and energy within the cell. When there isn’t enough cellular energy left over after dealing with ongoing metabolism, there will not be enough energy to remove mucous and infection from lung tissues, or to rapidly heal minor tears in fragile capillary tissues. From this viewpoint, healing takes place when only when SURPLUS energy exists. Healing does not take place when raw materials are available and not enough energy exists. Having cellular energy over and above the amount needed to maintain the life of the cell is the only way to cause healing to proceed. That is why healing normally only takes place during sleep when cellular energy requirements drop to a minimum and excess energy can then be used for healing. All other curative efforts that ignore giving the cell extra energy dwindle in important next to dealing with the root cause of lack of healing, which is lack of excess cellular energy. Alpha polysaccharide peptides are the only sure way to increase energy within the cell. CN furnishes 100% alpha polysaccharide peptides and we highly recommend it’s use with equine bleeding. Kaye Cottle, Trainer, Hawkes Bay, New Zealand, says, “We had high hopes for Teddy a three year old thoroughbred, he appeared to have the drive and heart to be a good racehorse. We had him on an organic diet, he trained well and seemed to be fit. We took him to the track to trial him and he performed quite well finishing third. However his nose was bleeding quite profusely, he was quarantined and after about 30 minutes seemed fine. Two weeks later we tried again, with same result. We started giving him two scoops a day of Equine CN and changed nothing else with his feed or training. Two weeks later we ran him at the track and was very happy, no bleeding. Since then he has competed in three races and no issues. I am very happy with Equine CN and recommend all trainers to use it.